*For singing lots of songs, to review or whatnot. Tape up paper pumpkins* and call it a pumpkin patch. Choose a child to pick a pumpkin from the patch. The pumpkin has a song to sing on the back. *or, tape song names on real pumpkins. 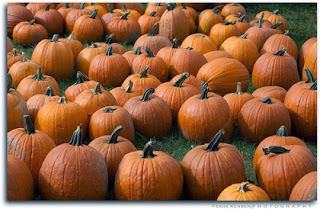 Or those cute baby pumpkins. Put faces on pumpkins to make the jack-o-lanterns. Sing the song the way the pumpkin’s face depicts.